My old boss from my days in television production at eOne is now an executive producer on Beaverton, a Canadian news satire series. 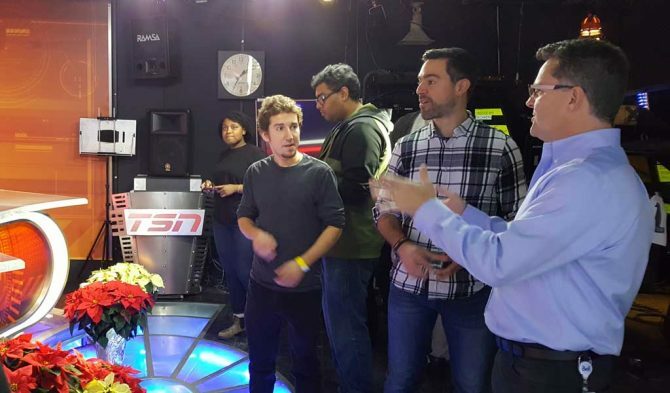 Recently, she was kind enough to open an invitation for me to bring some of my Toronto Film School students to be part of the studio audience and get an exclusive tour of the CTV studios. As someone who has worked in both film and television, I know how valuable an insider learning experience like this can be, where you have the opportunity to see exactly who is involved, what is used, and observe the process. There were limited spots for the field trip, and my name was on the line so an invite was put out to students in my classes who had accomplished a perfect professionalism mark. This is something I try to explain to all my students (in both the Writing for Film & Television and the Film Production diploma programs), which is, think of your time at TFS not just as a school, but also as the first step in your career. Those students who demonstrate a clear sense of commitment and professional behaviour are more likely to have peers and instructors vouch for them. I offered the spots on a first come first serve basis so those who promptly responded with a firm commitment got the spots. 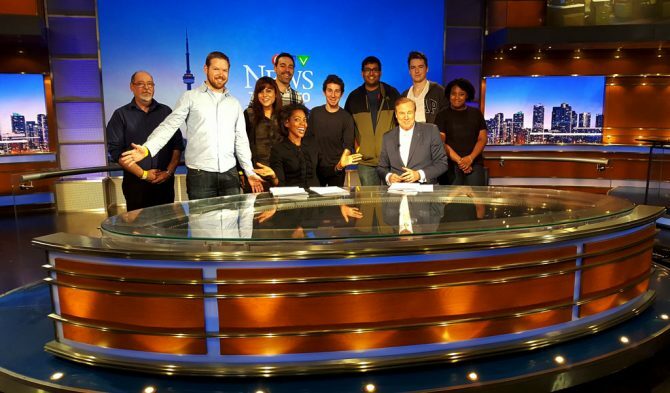 On the day of the field trip, we arrived on time at the CTV studios in Toronto. We were greeted by staff and began a behind the scenes tour. We were introduced to high-level staff including the station manager who took us around. 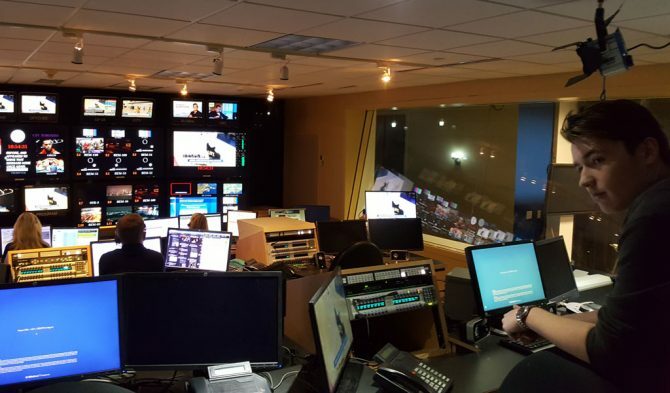 We started with getting to be in the control room for a live news taping and watch the process unfold as the director and producer gave instructions. We then got to go out on the floor to watch the news team in action. During a commercial break, we got to ask questions and pose for a photo with the anchors. Next up we got to see the behind the scene of the Beaverton as they got everything ready for the taping we would return for. My friend greeted us and gave us a bit of background on the show and how it got off the ground. We then got to walk through the production offices to see the seas of desks of all those involved in bringing these shows to life. The students had a chance to stop by the post rooms to talk with the editors and sound supervisors working on pre-taped content. After this, we moved on the TSN and then Sports Centers. Both were a more frantic pace than the newsroom which was a big surprise for most of us. This was due to the continuous content being done in sports as opposed to the one-hour news taping. Were given a chance to check out the equipment and have a lengthy Q & A. Finally, we returned to the Beaverton studio and were treated to the full taping. Lots of laughs, prizes and a chance to see all that takes place to make that show happen. We ended with a group picture with the hosts and were given goodie bags to leave with. The students and I all had a great time and I am happy to report that the kind folks at CTV were left impressed by the TFS students. This kind of representation by the students is key for further our reputation and opening the door for future opportunities like these, so a personal thank to all of them for stepping up. Dave McGrath – Instructor for the Film Production and Writing for Film & Television programs at Toronto Film School. Dave has a background in TV development, formerly the manager of film development at 9 Light Entertainment, and is a writer-director that has also produced award-winning films such as the single take thriller Broken Mile (2017).